If you’re taking a statin medication for your cholesterol, you have undoubtedly heard the warning against consuming grapefruits or grapefruit juice. This restriction also applies to a number of other medications including certain cardiovascular medications, anti-cancer agents, antibiotics, antidepressants and others. For a more detailed list and approximations about the extent of the interaction with particular medications click on to the following site: http://www.cmaj.ca/content/suppl/2012/11/26/cmaj.120951.DC1/grape-bailey-1-at.pdf. The discovery of the interaction was serendipitous. Researchers noticed a higher drug concentration in certain test subjects than others when a medication was initially being tested. 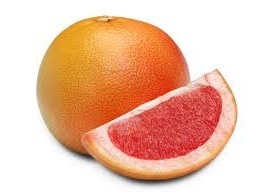 Those with an elevated drug level were eventually found to have also consumed grapefruit. Pomelo, lime and marmalade can also produce the same effects. The compounds in grapefruit responsible for the effect are called furanocoumarins and act by blocking the enzymes in the intestines responsible for the degradation of certain medications. It only takes one glass of grapefruit juice to produce the maximum effect, an effect that persists for longer than 24 hours. Therefore, taking grapefruit juice at a time well-separated from the medication dose is ineffective in solving the problem. How big an issue does this represent? That depends on a number of factors, particularly on how dependent the medication is on the enzyme that is blocked by the juice. Some medications have a wide “therapeutic range.” In other words, increased blood levels don’t represent much of a concern. On the other hand, some medications have a narrow therapeutic range, with increased concentrations causing serious problems. Although most statins should not be taken in combination with grapefruit products Crestor (rosuvastatin) and Pravachol (pravastatin) are exceptions since they are not significantly metabolized by the enzyme blocked by grapefruit.